The eyelids may be affected by benign and malignant lesions. Most of these are common elsewhere on the body, but when occurring on the eyelid they are often different in character, appearance, and behavior because of the unique characteristics of eyelid skin. A large number of cutaneous and systemic disorders may be associated with eyelid lesions. In many instances the eyelid findings are quite specific for a particular disorder, at other times they may be rather non-specific. These ocular findings in combination with other cutaneous and systemic abnormalities frequently allow the clinician to make the correct diagnosis. Localized unilateral eyelid lesions most commonly represent benign or malignant neoplasms, infections, or inflammations. Bilateral lesions more frequently represent disseminated systemic conditions such as collagen vascular diseases, metabolic disorders, vesico-bullous diseases, dermatoses, and hypersensitivity disorders. Eyelid lesions are classified according to the anatomic structures from which they arise. These include the epidermis, dermis, and various cells and adnexal structures within these layers. 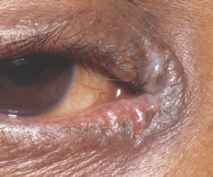 Eyelid inflammations may present as a localized or diffuse erythematous area. 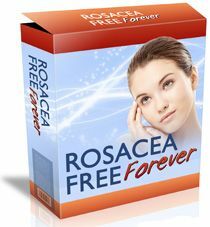 They can be associated with ulceration, induration, eczematous changes, necrosis, edema, or loss of eyelashes. If skin contraction occurs the eyelid margins may be malpositioned manifesting as an ectropion or canthal angle dystopia. Inflammatory lesions may be painful and at times can be associated with lymphadenopathy. Infectious conditions of the eyelid result from viral, bacterial, fungal or parasitic processes and may be primary or secondary. The latter can result as extensions from head and neck foci such as the sinuses or lacrimal sac, or from hematoge-nous spread from distant sites. The cause of the infection on the eyelid is often evident, such as in a site of trauma or recent surgery. However, when the infection is either atypical or recurrent, a biopsy, smear, or culture may help to exclude the presence of occult malignancy or unusual infectious organism. A systemic evaluation may also be valuable for particularly aggressive infections and those caused by fungi and parasites. From several recent large series looking at the frequency of eyelid lesions benign processes account for approximately 70% to 75% of all lesions, and malignant neoplasms for 25% to 30% (1-5). Among the benign lesions the most frequent diagnoses are squamous papilloma (26%), nevus (22%), cysts (20%), seborrheic keratosis (13%), vascular lesions (9%), and neural lesions (< 1%). The most common malignant tumor on the eyelid is the basal cell carcinoma followed in rapidly descending order by squamous cell carcinoma, sebaceous cell carcinoma, and malignant melanoma. Other rare tumors such as Kaposi's sarcoma, adnexal carcinomas, and Merkel cell tumor are occasionally seen, as are metastatic cancers. One large series of nearly 1100 malignant eyelid tumors from China showed the frequencies of basal cell and sebaceous cell carcinomas to be nearly equal at 38% and 32%, respectively, quite different from the usually quoted values from the Western literature. However, most other studies give the frequency of malignant tumors on the eyelids as 80-85% basal cell carcinoma, 7-9% sebaceous cell carcinoma, 5-10% squamous cell carcinoma, and 1-5% malignant melanoma (1-3,5). As with diseases elsewhere in the body, the medical history can be very important in the identification of eyelid diseases and should precede the ophthalmic examination. Many congenital eyelid lesions may be associated with other developmental anomalies and systemic conditions requiring pediatric consultation when necessary including possible genetic counseling. In the adult, acquired malpositions and involutional changes usually precipitate or accompany the development of cutaneous lesions. Inflammatory conditions have characteristic clinical findings, but these often overlap with more serious diseases such as malignant tumors. A careful history that focuses on the onset of the eyelid disorder, the time course, presence of concomitant changes or symptoms, travel history, and prior therapy is helpful in narrowing the examination and deciding on any specific ancillary studies. The family history should also be reviewed since the presence of eczema or atopy may be important in pruritic lesions. Many neoplasms such as neurofibromatosis occur as part of heritable illness. A social and travel history is critical. An occupational history is also important as a considerable number of skin reactions are caused by or are worsened by exposure to various chemicals in the work environment. A lesion is any single, small area of skin pathology. Lesions may be solitary or multiple. A rash represents the totality of multiple lesions. As such, it is essentially synonymous with the term eruption. A macule represents a small area of color change. A macule is flat and not palpable. Some macules are slightly depressed below the surface of the skin; these are termed atrophic macules (Fig. 1). Generally, macules are less than 1.5 cm in diameter. A patch is an extension of a macule in length and width. By definition a patch is an area of color change that is 1.5 cm or larger in diameter. Figure 1 A macule showing a nonpalpable flat area of color change. Figure 2 A slightly elevated palpable papule. A papule is a small palpable lesion less than 1.5 cm in diameter. Most are elevated, although some papules are visible but not necessarily elevated (Fig. 2). Papules may be of any color and the surface may be smooth or rough. They come in a variety of shapes such as sessile, pedunculated, filliform, and verrucous. A wheal is an edematous papule in which the substance of the lesion is made up of nonloculated, interstitial fluid. A plaque is an enlargement of a papule in length and width. As such, it represents a planar enlargement of a papule. Most plaques are elevated but may be palpable without being visibly raised above the skin surface. A cyst is a cavity with a cellular lining derived from glandular, ductal, or epidermal elements (Fig. 3). It is filled with fluid or more consolidated material secreted by these cells. A vesicle is a small blister less than 0.5 or 1 cm in diameter, depending on the author. It can be considered as a fluid-filled papule in which the fluid is loculated. For this reason, when the roof of a vesicle is incised the fluid runs out and the compartment collapses, in contrast to a wheal which when incised produces a drop of fluid on the surface, but the lesion does not change in size or shape. A pustule is a vesicle that is filled with neutrophils (Fig. 4). For this reason it is white, or yellow-white, in color. A bulla is a blister that is larger than 0.5 or 1 cm in diameter, depending on the author. It is otherwise entirely similar to a vesicle. The fluid in a bulla is usually contained in a single compartment, but occasionally multiple compartments are present. Figure 4 A pustule filled with purulent material of neutrophils. Figure 3 A clear sweat gland cyst, representing a fluid-filled cavity. Many lesions, regardless of their etiology, can show surface modifications involving their epidermal component. These can sometimes make identification more difficult and in some cases can mask the underlying pathologic process. The epidermis may be palpably thickened (acanthotic) and/or its surface may be scaling (hyperkeratotic). For example, excessive keratin deposition can be seen with many different types of lesions leading to a "cutaneous horn." However this is a descriptive term only and can be seen with numerous benign and malignant lesions. The epidermis may be damaged causing weeping and crusting, or areas of missing epidermis results in areas of erosion or ulceration. 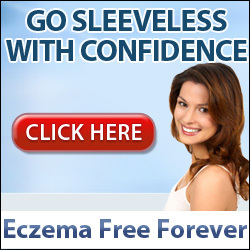 Scale occurs when there is an abnormal increase in the outermost layer of the epidermis, that is the stratum corneum. A scale is thus made up of flattened keratinized cells that, for one reason or another, are accumulating on the surface of the lesion. 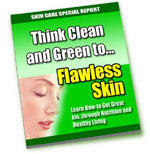 This process may be due either to faster than normal creation or slower than normal exfoliation of these cells. Several types of scale are recognized; pityriasis-type scale and lichen-type scale. Pityriasis-type scale consists of flakes too small to be individually visualized. For this reason pityrisasis-type scale cannot ordinarily be seen unless the surface of the lesion is scraped. Scraping the surface in this situation results in a small pile of fine white powder. Because of this characteristic, pityriasis-type scales are just barely palpable as a slight roughness on the surface of the lesion. Lichen-type scale is tightly adherent to the surface of the lesion. It is palpable as a slight roughness and, because of reflected light, is visible as a shiny surface (Fig. 5). In order to appreciate this shininess it is often necessary to move the light back and forth over the lesion until just the right angle for reflection is obtained. Figure 5 A lichen-type scale showing a Figure 6 A crust formed from dried blood shiny reflective surface. and exudate. 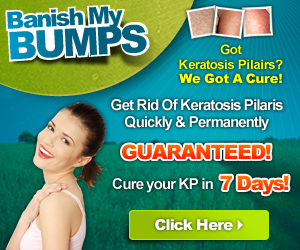 Crusts occur when plasma exudes through a damaged or absent epidermis. It represents the dried serum proteins after water has evaporated. A crust is rough on palpation and is visible as amorphous material that is yellow to brown in color (Fig. 6). Where damage to the skin occurs more deeply than the level of the epidermis, blood vessels will be disrupted and there may be a component of dried blood mixed in with the crust. In such situations the color of the crust will be red, violet, or black depending on the amount and freshness of the blood present. An erosion occurs when the epithelial surface of a lesion is absent (Fig. 7). This may occur either because of the breakdown (or removal) of an overlying blister roof or as the result of trauma, especially that from scratching. Erosions formed as a secondary change to blisters are generally round in configuration. They often have an encircling collarette of scale representing the peripheral remnants of the blister roof. On the other hand erosions formed as a result of external trauma generally are angular or linear in configuration and lack the collarette of scale. The visible depth of an erosion is quite shallow since, by definition, no dermal damage is present. The surface of an erosion may be moist (weeping) or may be covered with crust. A fissure is a special type of erosion that forms as a thin crack between adjacent islands of intact epithelium; these fissures form when epithelial cells shrink as a consequence of excessive dryness. They can be conceptualized as similar to the cracks that form in a dry lakebed. Figure 7 A superficial erosion with Figure 8 A deep ulcer involving the missing epithelium. epithelium and dermis. Figure 9 Lichenification with thickening of the epidermis and superficial scales. An ulcer is similar to an erosion in that the overlying epithelium is absent. However, dermal damage is present, and the resultant defect is visible deeper than that of an erosion (Fig. 8). This dermal damage is almost always accompanied by vessel disruption and bleeding. Hence, the crusts that form within ulcers have red, violet, or blue-black hues, which accompany the presence of blood. The blood also adds fibrin which in turns adds "toughness" and adherence to the curst. This difficult-to-remove dark-colored crust is known as eschar. The epidermis responds to chronic trauma with increased cell proliferation and increased keratin production (Fig. 9). The characteristic morphologic features of lichenification include: palpable thickness of the skin compared to nearby normal skin; accentuation of the normal cross-hatched skin markings; and the presence of lichen-type scale. Lichenification is especially characteristic in the chronic lesions of atopic dermatitis and neuro-dermatitis. It is particularly marked in the variant of these two diseases known as lichen simplex chronicus. The arrangement of lesions refers to the pattern or relationship of nearby, non-confluent, lesions. Typical arrangement patterns include clustering (a grouping of lesions), beading (closely set, but not confluent papules in a linear or circular arrangement), satellitosis (small peripheral lesions around a central larger lesion), reticular (lattice or net-like arrangements), and linear. A rough estimation of size is indicated by the term chosen for the basic lesion: vesicle versus bulla, macule versus patch, and papule versus plaque. In each of these pairs the point of separation occurs at about 1.5 cm in diameter. However, in most instances an actual measurement of the diameter should be given. Where a lesion is other than round, the shortest and the longest diameter should be stated. Where multiple lesions are present one can determine the size of the most representative lesion and then give the range of sizes. 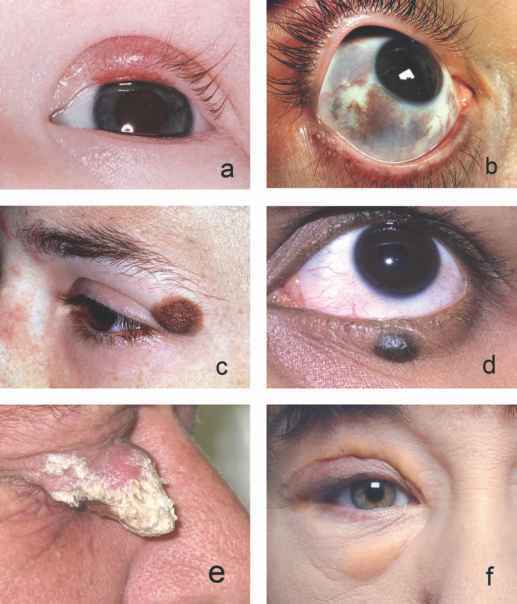 Figure 10 Color variations of eyelid lesions. a. Red; b. blue; c. brown; d. black; e. white/gray; f. yellow. Color is surprisingly hard to describe accurately. This is partly due to the lack of absolute color standards and partly due to the confounding effect that the patient's normal skin color has on lesional color. One must also discount the color contributed by "secondary" characteristics such as scale or crust. This can usually be accomplished by looking at the peripheral edge of a lesion, since both scale and crust are often less prominent in this location. The basic hues found in skin lesions are red, white, blue, brown, black, yellow, and "skin" color. Each of these colors often gives a clue to the nature of the lesion (Fig. 10). Configuration represents the shape of the lesion as it is seen from above. Common types of configurations include nummular (coin sized and shaped), gyrate, annular (ring-like border with some degree of clearing in the center), and linear lesions. Most lesions have a circular configuration. A few lesions are oval, notably those of pityriasis rosea, and many others are irregular in shape. Examples of irregular shapes include gyrate and serpigenous lesions, which generally occur due to the melding of adjacent lesions that are enlarging in a centrifugal manner until they reach the point of confluence. Such lesions are frequently found, for example in psoriasis and urticaria. On the other hand, irregular lesions with angular or linear shapes generally occur as a result of external trauma such as scratching or are due to the direct inoculation of antigen (ocular medications) or virus (linear warts). Linear lesions (the shape, not the arrangement of a group of lesions) are special types that occur as part of the Koebner phenomenon. Here, external trauma is followed sometime later by the appearance of lesions in the traumatized site. This phenomenon, also known as the isomorphic response, is a characteristic feature of psoriasis, lichen planus, and a few other less common diseases. Figure 11 Margin characteristics of eyelid lesions. a. Sharply defined; b. diffuse. a general way the shape of the shoulder reflects the depth of the pathology; very superficial lesions tend to be square shouldered and deep lesions tend to have sloped shoulders. Diffuse margination refers to a blending of the lesion into the surrounding skin over several millimeters such that the edges cannot precisely be defined. The surface of a lesion provides clues as to its location within the eyelid skin. Lesions arising from the epidermis tend to have more sharply marginated edges. The lesion itself is usually irregular with loss of normal epithelial fine markings and topography. In contrast, dermal lesions tend to elevate and stretch the overlying epidermis which usually retains normal topography, although with large lesions the epithelium may be thin, smooth, and shiny. The edges of dermal lesions are sloped and blend gently into surrounding tissue. In general, the surface of a lesion is often described as smooth or rough (Fig. 12). Roughness occurs when either scale or crust is present. Differentiation between these two changes is important since scale is usually associated with epithelial hyperplasia, and crust is associated with epithelial damage. Crust is always visible, whereas scale may or may not be visible. Thus roughness in the absence of visible change is always due to the presence of scale. Crust may be of the superficial type (yellow or yellow-brown color) or of the hemorrhagic type (red, violaceous, or black color). The former overlies erosions, and the latter overlies ulcers. In the evaluation of any eyelid lesion one of the major goals is to rule out malignancy. Most malignant neoplasms arising on the eyelid skin can mimic benign lesions and therefore can easily be missed. Although the large majority of eyelid lesions will be benign, the consequences of misdiagnosis are significant enough so that any undiagnosed lesion or one that does not respond to medical therapy should be biopsied for histopathologic examination. Information gained from the clinical history may also suggest malignancy. Most important here is progressive growth which may be slow or rapid. Other suggestive findings are irritation, intermittent drainage, bleeding, crusting, and changes in pigmentation. Certain clinical characteristics often suggest malignancy. (see Table 1 for summary.) These include irregular shape, rolled "pearly" borders, and associated induration (Fig. 13). Malignant lesions often have a "hardened" feel on palpation when compared to the surrounding skin. Erosion is common as is ulceration leading to hemorrhage, exudation, and crust formation. Telangiectasias, or fine new vessels, are particularly suggestive of malignancy (Fig. 14). Alterations of normal architecture including obliteration of epithelial folds and lines, loss of lashes (Fig. 15), and absence of meibomian gland orifices is particularly characteristic; benign lesions generally do not invade or distort normal eyelid structures. Malignant lesions frequently are not painful or tender. Figure 13 Rolled pearly borders Figure 14 Telangiectasias are fine Figure 15 Loss of eyelashes suggestive of malignancy. dilated blood vessels seen within a associated with a carcinoma of the lesion. eyelid. Another important warning sign is fixation to deeper tissues or bone. This often suggests infiltration. Regional lymphadenopathy can be seen with infectious lesions, but should also raise suspicion for squamous cell, and especially sebaceous cell carcinoma. Restriction of ocular motility and proptosis suggest deep orbital extension and requires evaluated by means of CT or MRI scanning. If malignancy is suspected, except for basal cell carcinoma, systemic evaluation for metastases should be undertaken. Abdi U, Tyagi N, Maheshwari V, Gorgi R, Tyagi SP. Tumors of the eyelid: a clinicopathologic study. J Indian Med Assoc 1996; 94:405-416. Bright DC. Dermatologic conditions of the eyelids and face. Optom Clin 1991; 1:89-102. Ni Z. Histopathological classification of 3,510 cases with eyelid tumor. Zhonghua Yan Ke Za Zhi 1999; 32:435-437. Obata H, Aoki Y, Kubota S, Kanai N, Tsuru T. Incidence of benign and malignant lesions of eyelid and conjunctival tumors. Nippon Ganka Gakkai Zasshi 2005; 109:573-579. Lee SB, Saw SM, Au Euony KG, Chan TK, Lee HP. Incidence of eyelid cancers in Singapore from 1968 to 1995. Br J Ophthalmol 1999; 83:595-597. Tesluk GC. Eyelid lesions: incidence and comparison of benign and malignant lesions. Ann Ophthalmol 1985; 17:704-707. Why are neoplasms lesions formed on eyelids?